About the Series: Heal yourself and others! Aromatherapy and essential oils are very powerful tools in natural health and healing. Take a whole-body approach and learn how to personally and professionally use aromatherapy for holistic health and mental, emotional, physical, spiritual, energetic, intuitive, and metaphysical well-being. Learn Clinical, Medical, & Intuitive Aromatherapy. Aromatherapy blends well with massage, bodywork, energy work, acupuncture, yoga, healing, counseling, nursing, Western Health care, meditation, TCM, Ayurveda, and naturopathy. This 300 hour online level 2 aromatherapy and holistic healing certification series created by Dr. Christina Wilke-Burbach PhD, RMT, CA is unlike any other one out there as it combines clinical, medical, folk, metaphysical, and intuitive aromatherapy. A focus is placed on holistic healing and working within all dimensions of the human experience. Throughout the series, you will learn over 40 aromatherapy techniques to bring balance to the mind, body, spirit, and energy system. Students also learn an Aroma Reading Intuitive Technique developed by Christina. Christina has a PhD in Health Psychology, is a certified aromatherapist, herbalist, Master Gardner, Natural Perfumer, is a Member of the American Botanical Council and commits to the highest level of safety and ethics. Educational Prerequisite: The Holistic Healing with Aromatherapy Level 1 certification with Dr. Christina Wilke-Burbach (or a level 1 certificate from a similar program) is required before moving on to level 2. Timeframe: Timeframe is flexible and series is self-paced, but it is suggested that students try to complete the coursework for level 2 within one year. Included with each module: Each module includes an 8 hour downloadable recorded class taught by Dr. Christina, a detailed 50+ page manual in PDF form, additional written materials and exercises, and a 30 minute individual consultation with Dr. Christina. Learn about essential oils, the mind/body connection, and Psychoneuroimmunology. Profile the top essential oils for emotional healing. Learn evidence-based essential oil therapy for emotional healing. Gain an in-depth understanding of clinical and medical aromatherapy uses, techniques, and blends for depression, stress, anxiety, mood balance, grief and loss, anger, inner child issues, addiction and more! Clinical aromatherapy techniques include Aroma guided meditation, breathe work, inhalation therapy, clearing emotional patterns, The Relaxation Response, Aroma Acupressure, Aroma Reflexology, and more! Module includes 8 hour downloadable recorded class taught by Dr. Christina, a detailed 50+ page manual, over 100 pages of additional written materials and exercises, and a 30 minute individual consultation with Dr. Christina. Tuition: $175. Pre-requisite: Holistic Healing with Aromatherapy Level 1 Certification. Recommended Books: Releasing Emotional Patterns with Essential Oils by Caroline Mein; Molecules of Emotion by Candace Pert. Class covers intuitive abilities and intuitive development with essential oils. We focus on intuitively choosing and using oils, muscle testing, dowsing, scrying, and doing intuitive readings, AROMA READINGS, with essential oils. Module includes 8 hour downloadable recorded class taught by Dr. Christina, a detailed 50+ page manual, additional written materials and exercises, and a 30 minute individual consultation with Dr. Christina. Tuition: $175. Pre-requisite: Holistic Healing with Aromatherapy Level 1 Certification. For those students pursuing aromatherapy level II certification. Practicum 1 includes the exam, hypothetical case studies, and recorded class. After the Aroma 205 class and before the Practicum 1 class, the student will take the final exam on their own time and submit to Dr. Christina for correction. Then the student will listen to the Practicum 1 class where heart-centered business practices, code of ethics, legal and ethical issues, aromatherapy best practices and standards, business development, branding, record keeping, networking, marketing, writing a business plan, and business forms will be covered in detail. A focus will be placed on Integrative Medicine and combining conventional medicine with aromatherapy. Hypothetical client case examples will also be discussed. Module includes 6 hour downloadable recorded class taught by Dr. Christina, a detailed manual, additional written materials and exercises, correction of exam and hypothetical case studies, and a 30 minute individual consultation with Dr. Christina. Tuition: $200. Pre-requisite: Attendance at all classes in the Holistic Healing with Aromatherapy Level 2 series. For those students pursuing aromatherapy level II certification. Practicum II includes a recorded class, completion of the research paper, an Aroma Guided Meditation presentation, completion of 20 hands-on-aromatherapy sessions, and a final individual consultation with Dr. Christina. Students have one year from the time they started level 2 to turn in their 20 hands-on aromatherapy sessions, research paper, and homework. After the student has completed all the requirements for level II, they will meet via phone or webcam for a 30 minute individual consultation with Dr. Christina to wrap up the series. At their final consultation, students will give their aromatherapy presentation (Aroma Guided Meditation) and discuss their hands on with Dr. Christina. We will also discuss continuing education and any business/practical concerns, etc. Module includes 6 hour downloadable recorded class taught by Dr. Christina, correction of the final research paper and hands on, and a 30 minute individual consultation with Dr. Christina. Tuition: $250. Pre-requisite: Attendance at all classes in the Holistic Healing with Aromatherapy Level 2 series. Registration Level 2 classes: Contact Dr. Christina with questions at mindsoulandself@yahoo.com or 608.393.7353. Payment in full is required before any class materials will be sent to you. All sales are final. Pay for the whole series in advance and receive a 10% discount! After payment is received, within 24 to 48 hours Dr. Christina will email class recordings, class workbook, and additional materials to student. The Holistic Healing with Aromatherapy series was created by Christina Wilke-Burbach and is intellectual property of Mind, Soul, and Self LLC. All rights reserved. 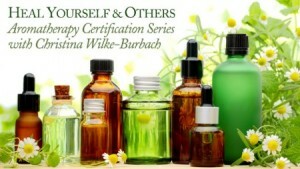 There is no other aromatherapy series or certification offered like this one!!! This series also teaches an Aroma Reading technique developed by Christina.